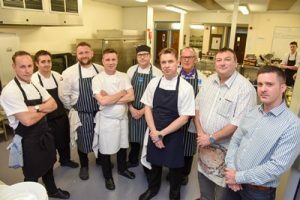 With one month to go until Plymouth ‘Flavour Fest’ – the West Country’s largest free food festival – returns for its 14th year (2-4 June), five of the City’s top chef’s got together with City College students to design a menu for 70 people. Chris & James Tanner (Barbican Kitchen) and Patrons of Flavour Fest 2017 joined Dave Jenkins (Rocksalt); Ben Palmer (Greedy Goose); and Mike Palmer (Two Bridges Hotel) to deliver a launch menu which included a Plymouth Gin and beetroot cured salmon starter and a main course of treacle brushed Pork Belly served with apple puree, creamed potato and Devon cider sauce. 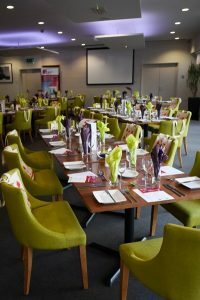 The meal was prepared and served at the PL1 Restaurant at City College Plymouth. 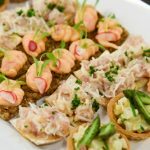 Flavour Fest is one of the Plymouth City Centre Company’s biggest yearly events and showcases the region’s best produce. The festival has food fun for all the family, including a chef stage, continental market and Children’s engagement programme. The event is expected to attract over 100,000 visitors to Plymouth over three days and see over 100 regional food and drink producers transform the city centre into a bustling hub full of tempting treats to try and buy. 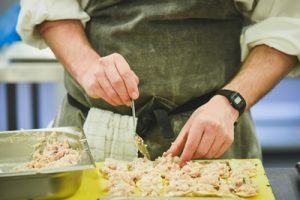 The main stage will be located under the Big Screen and see chefs sharing their tips of the trade and demonstrating how to create some delicious dishes. Amongst those confirmed as appearing over the three days are Chris and James Tanner; Mitch Tonks and Bake-Off winner Candice Brown. Local chefs too, such as Dan Maddocks, Paul Doidge and Sean Mott have also been confirmed. The Fun Kitchen area for kids will return, sponsored by Tesco Plymouth, enabling children to discover how food is transformed into meals, and get involved in a fun and interactive way.